The return of a hit play, in Hindi. 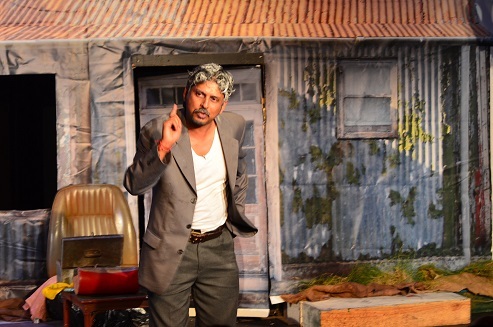 Bhagwan Gave Me This Life was written and directed by well-known theatre veteran Vivian Moodley and is brilliantly performed by Pranesh Maharaj. It will run from May 2 to 5, 2019, at the Durban North Conference Centre. Billed as a Hindi play, it is performed in the unique Durban patois that developed from Hindi, with smatterings of English and isiZulu. Set in Inanda in 1981, the drama focuses on the life reflections of a widower Balram. Maharaj explains: “Vivian had a script in his hand that he wanted me to read. I lunged at it, to get back to him a day later and say that I'll do it. That's when he gave me the ultimate twist in this production: He wanted me to perform it in Bhojpuri (Nataalie Hindi). The sight of those wood and iron, or tin houses as they were known, evoke strong feelings for many people. The corrugated walls, wooden doors with patterned glass panels, sash windows and the verandas with lush coastal vegetation around them speak of a bygone era, although many of those same houses are still standing today. We find a disconsolate Balram, snoozing on an upholstered car seat, propped up against the wall. He is not sleeping peacefully – his dreams recall the tragic dramas of his life and when he awakens, it is to find he is still alive – and alone. Loneliness is the biggest enemy that elderly people have to overcome – and when they have had a life surrounded by family members and the community, it can be a hard pill to swallow. We watch Balram struggle as an ageing man, portrayed with great sensitivity and authenticity by Maharaj, as he goes through some of the daily rituals that help his day pass. He prays by the shrine, fills the upturned wheel rim with water for the birds and takes a nip of cane spirits from a small bottle hidden in a safe box. There are other treasures in that box and the sight of them bring to mind memories of his youth. The anklets with bells and the silver headdress that were worn by his wife, recall his first meeting when he was a shy young man in the marriage market. With skill and expertise, Maharaj paints the portraits of the eccentric aunts that acted as marriage brokers, as well as playing the entire family of characters who attend the wedding. He plays out the male and female roles with an adroit combination of hilarious lip-syncing and the use of his own tuneful and powerful voice. Most impressive are the tabla-like rhythms that he extracts from an old paint tin in his pursuit of happiness. We are carried along on the wave of the story - a story that, says Moodley, is a composite picture of the community he grew up in and inspiration that stem from various 'Indian' communities within the Greater Durban area. The tale of the two brothers, the woman abused by her alcoholic husband, the grandparents longing for a child – all are grist to the mill of the storyteller. Maharaj shoulders all the roles, giving each their weight and value, teasing out the comedic lines and giving full range to the dramatic tragedy that serves as the denouement. The human condition can be described as the unalterable part of humanity that is inherent and innate to human beings and is not dependent on factors such as gender, race or class. It includes concerns such as the meaning of life, the search for gratification, the sense of curiosity, the inevitability of isolation, or awareness regarding the inescapability of death. Bhagwan Gave Me This Life runs from May 2 to 5 at the Durban North Conference Centre. Performances take place on May 2 at 19h00, May 3 at 20h00, May 4 at 19h00 and May 5 at 18h00. Tickets R150 available at Computicket online or at Shoprite / Checkers. For more information contact 031 563 9176.